Acrobat ants are so named because of their behaviors; they raise their abdomens above their heads when they’re disturbed, and some species emit foul odors. One of the identifying characteristics of the acrobatic ant is their heart-shaped abdomen which can be seen in the photo above. The US is home to several acrobat ant species, with most being less than 6mm in length. In this guide, homeowners will learn where and how infestations occur, and they’ll also get some tips on eradication and prevention. How do Homes Become Infested With Acrobat Ants? These ants usually live outdoors in nests built within decaying or dead wood. However, they often invade homes through low hanging tree branches, gaps around pipes and wiring, or foundation cracks. Once they’ve made it indoors, an acrobat ant colony nests in the home’s woodwork and insulation, gradually making its way into the kitchen in search of food. 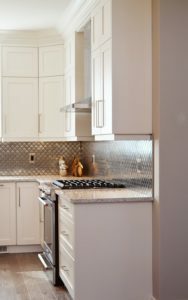 Keep an eye out for accidental spills – they can happen in the cleanest kitchens! In the kitchen is where I first came into contact with the acrobatic ant. I found them marching along the door jam and window sill next to where our trash was kept. However, I also saw them crawling on the ceiling to get from one room to another. When the exterminator identified these little guys as acrobatic ants, I could certainly understand the name! While they originated outside, I did find the thing that was inviting them indoors. We kept our kitchen garbage in a pull out drawer. After much searching, I found an empty food container had missed the trashcan & was laying toward the back of the cupboard. They were having quite a party back there! Are Acrobat Ants a Serious Problem? Acrobat ants need to keep their nests moist, and their appearance can indicate a leak within the home. 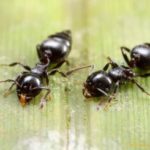 A homeowner may find the insects traveling from a nest to a food source, and the adult ants create an annual mating swarm that can be quite alarming. And while the ants themselves are not harmful, they are typically a sign that something else in the house is out of balance. For this reason, you should always conduct a thorough investigation to locate the cause of your intruders. As mentioned previously, acrobat ants nest inside buildings and insulated spaces. 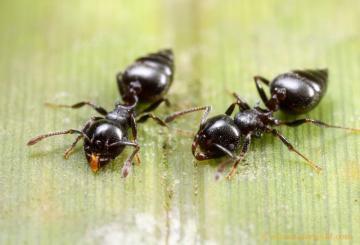 The most apparent sign of an infestation is a trail of ants on the hunt for a food source. Another indication is the debris these ants deposit as they dig their nests; it usually consists of dead ants and foam insulation. When they’re outdoors, acrobat ants prefer to nest in moist areas such as those in stumps, under stones, and in woodpiles. When they come into a home, however, an acrobat ant colony will look for a damp area in the roof or behind siding. 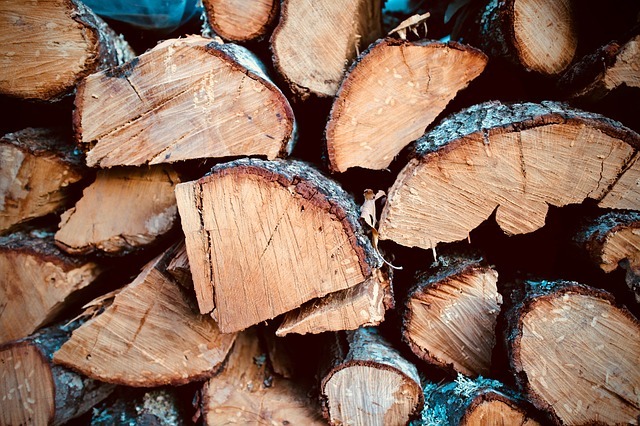 Ants love to nest in woodpiles, so keep them well away from the house. Little is known about the biological behaviors of acrobat ants. Like most other ant species, they produce males with wings and females known as swarmers, which fly from the nest to mate. Once mating is over, the females spread out and become colony queens. The queen ants lay eggs, which are tended by worker ants. 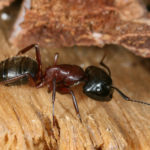 As the ants can enter the home through close, low hanging tree branches, a homeowner may have to trim their trees and shrubs to stop an acrobat ant invasion. Next, it’s a good idea to check attic vents and repair screens if necessary. Seal gaps around pipes and utility lines but call an electrician or the utility company to handle electrical wires. Keep firewood away from the outside of the home and consider removing tree stumps that contain acrobat ant nests. Because these nests are hard to detect, it is usually best to let a professional pest control provider handle an infestation of acrobat ants.